Today, The Guelph Mercury ceases to exist and what’s left of The Mercury organization will be folded into the bi-weekly flyer wrapper that is called The Guelph Tribune. You’ll find plenty of commentary elsewhere about the collapse of the local mass advertising model (which supported local mass media), laments about the state of journalism, and the health of democracy. This is a look at the end of the Mercury and what it may foreshadow for Hamilton’s local paper. Across North America, local daily newspapers are folding. The Mercury’s end, as part of this trend, is only a bullet point on the list of shuttered newspapers. It’s story is similar to that of other smaller cities. For Hamilton, this is more than a bullet point. The end of the Mercury is a gut check. The Mercury is part of the same newspaper conglomerate as The Hamilton Spectator and was one of three, now two, dailies owned by Torstar’s Metroland west group and share the same regional publisher. The other remaining daily is the Waterloo Region Record. The same regional publisher who ended The Mercury will play a key role in deciding the fate of our local daily. Shutting a newspaper is a complex decision and there are many considerations at play, here are two we’ll look at: real estate and the local market. Most newspapers headquarters are located on prime land, often prime downtown land. For many dailies, their real estate – often built and expanded during their best days following the Second World War – more than they are capable of holding with their declining revenues. 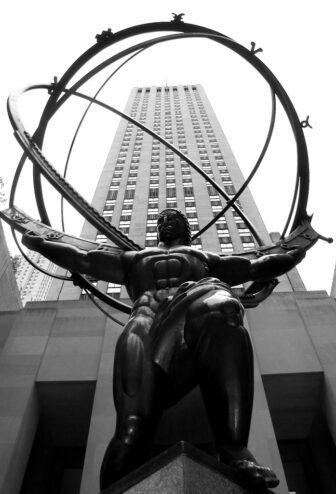 Statue of Atlas at Rockefeller Centre in New Year City. Use the imagery of Atlas holding the world, as the world grows in size with the Internet, Atlas is shrinking with age. Pick your choice combination of the two factors causing Atlas to no longer have the strength need to hold the world, the end result is the same: newspapers are collapsing. Newspaper buildings, which once projected the power of the industry, are a legacy burden. Built at a time when staff counts were in the hundreds, they now cavernous spaces house smaller staff measured by the dozen. Costly maintenance and overhead costs, combined with real estate value, create a predictable outcome: newspaper buildings are being sold and staff are moved into smaller leased space. TheSpec’s sister paper, The Record, sold its valuable highway bordering property to move into downsized downtown Kitchener office in 2005. The site is now a movie theatre and box store mall. The Mercury’s buildings are in the heart of Downtown Guelph. They’ll fetch a good price for Torstar. As a “bonus”, Torstar has no relocation costs. The Hamilton Spectator’s real estate is different than most other newspapers of older urban centres. TheSpec’s building at 44 Frid Street, alongside the 403, was designed as the corporate nerve centre of the newspaper chain. That’s the reason is so expansive for a mid-sized city newspaper. A prime location with direct highway access and visibility to the over 100,000 vehicles passing by each day, TheSpec’s real estate value is substantive and worth more on a spreadsheet than the newspaper brand. However, the healthy valuation on the property and building do not reflect the difficulty in selling a structure built and designed at the peak of industrial newsprint production. We live in an age where investment is driven by small to medium business (SMB), the building at 44 Frid Street is too large for the needs of any individual SMB. Factor in building age at 38 years and not only is it large, it due for mid-life renovation – another factor making it harder to sale. There’s also the most important feature of the building to consider, the industrial machine that was the true power of the newspaper: the printing presses. The building isn’t easily demolished in favour of just the underlying land’s value. 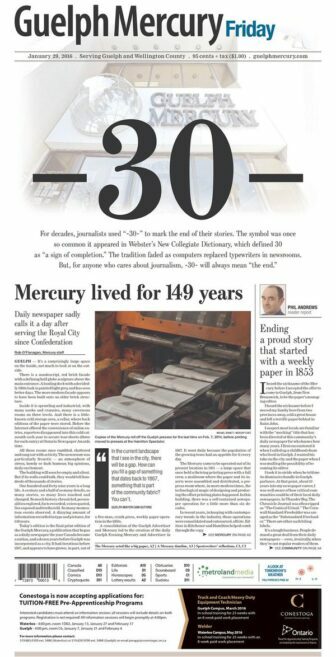 The Mercury was printed at 44 Frid. The loss of printing and production work at TheSpec is the most direct local impact. Will there be layoffs in Hamilton? This remains to be seen. With less than 9,000 copies, the impact on the printing press schedule is minimal. However, the copy desk work is likely to see “attrition” or layoff. The Mercury’s final end was set less than two years ago. On Feb. 7, 2014, the final print of The Guelph Mercury in Guelph saw the shutdown of its printing press. This was a major move for a newspaper – the presses were the single most valuable asset owned by newspapers during the pre-internet age. Two weeks ago, The Toronto Star outsourced its printing operations to Transcontinental Inc. and shut down its massive printing operation in Vaughan. Transcontinental’s contract with The Toronto Star is for five years, and renewable. At present, Torstar’s Metroland unit operates five printing presses, including two in Hamilton: TheSpec and Hamilton Web Printing at 333 Arvin Avenue in Stoney Creek. Arvin is a legacy of the Brabant chain of community papers which was purchased by Torstar in 2003. How much longer will a declining printing publication industry support two printing presses in the same City? I cannot emphasis enough the significance of the printing press as a signal of the future for TheSpec and its headquarters. If TheSpec’s printing press is shut down, it will set the printing plate on the future of 44 Frid Street. The printing press is the only function in 44 Frid which cannot be relocated. The obvious difference is that Hamilton’s market size is six times larger than Guelph. The Spectator has more runway. The runway still ends, it’s just longer. While our census metropolitan area average income level is slightly lower than Kitchener-Waterloo-Cambridge which includes Guelph, Hamilton’s economic makeup is vastly different than Guelph. Government is the most important sector in Hamilton. Hamilton Health Sciences, McMaster University, the City of Hamilton, and the Hamilton-Wentworth District School Board are all major print advertisers for TheSpec. Last year, Council rejected a proposal to hire a media buyer. The media buyer plan involved shifting the City’s advertising to digital and to seek more competitive advertising rates. The decision to not modernize the City’s advertising purchases extends the runway available to TheSpec. In effect, the government sector is subsidizing the print newspaper. If the government sector in Hamilton modernizes its media buying, this will significantly decrease TheSpec’s runway. National advertising pressures are worse in the Hamilton market compared to elsewhere, Hamilton’s seen as a lower-rated market for national advertisers. Combined with Toronto media penetration into Hamilton, the root cause of newspaper collapse is worse here. We witnessed this in the collapse of CHCH’s all day news format in December. We don’t know how much runway is left for TheSpec, that may be known to TheSpec’s publisher, it is definitely known by TheSpec’s masters at Torstar headquarters. We have no reliable third-party measure of TheSpec’s subscriber count or profitability. No newspapers are auditing their circulation numbers. (CORRECTION: I meant to state subscriber numbers. TheSpec does release its circulation numbers) Even those they are “growing” in their markets don’t have audit numbers attractive compared to a decade ago. They are not going to fund an audit. TheSpec’s financials are bundled within Torstar’s financials, so we don’t know local newspaper revenue. We do know The Mercury had a circulation figure of 12,000 until Monday when Torstar revealed it had less than 9,000 subscribers. The Mercury’s drop is consistent with an analysis of American newspaper subscription decline published nine days ago by ProPublica president Richard Tofel. Whatever TheSpec’s numbers are, it’s unlikely they deviate from the industry trend. 44 Frid is hard to sale, but not impossible. There are two obvious buyers: The City of Hamilton or McMaster University. The City’s looking to sell its 330 Wentworth Street North public works yard to Metrolinx to become the LRT garage. Staff are looking at suitable locations for relocation. 44 Frid offers office space and the strength of the printing press foundation allows for conversion to a garage for public works vehicles and can become part of a new garage complex. McMaster University’s goals include expanding the McMaster Innovation Park on Longwood Avenue. The City’s street grid can give the mistaken impression of the distance between TheSpec and Innovation Park. The properties only an industrial park block apart. The City plans to extend Frid Street to connect to the McMaster Innovation Park, once this is complete, 44 Frid Street is a fit into McMaster’s longer term plans. If Torstar needs to get 44 Frid off the books, or relieve itself of maintaining the building, a transaction with McMaster can involve a tax receipt. Retail outlets or warehousing are other potential uses. Torstar sold The Record’s and are selling their Vaughan printing plant’s real estate. They will sell The Mercury’s downtown Guelph property. It’s reasonable to expect them to eventually sell 44 Frid Street. Personally, I expected Torstar to eventually convert Spectator subscribers to Toronto Star subscriptions with a “Hamilton edition” including a few page Hamilton section produced under the Hamilton Spectator brand. This consolidates national advertising under The Star brand while maintaining local advertising revenue within a local insert section. I thought this more likely after the Transcontinental deal. With a sale of 44 Frid, TheSpec could return to downtown offices and survive as a brand within a larger regional newspaper reflecting the increasing integration of the Greater Toronto Hamilton Area. But no, The Mercury brand is dead and Torstar’s going with their flyer wrapper as their local news banner. That’s a travesty, not keeping the brand. Torstar’s not even converting Guelph Mercury subscribers to the Waterloo Region Record. It now appears more likely in my mind that we are facing a possible elimination of TheSpec brand. I feel it often gets loss when journalists write about newspapers layoffs (and I’m guilty of it) is that many more people lose their jobs outside the “editorial department”. I don’t know The Mercury staff, I do know people at TheSpec. Advertising works hard every day to sell what journalists are publishing to advertisers. It’s a hard job to convince a medium-sized business with tight margins to purchase a print ad. Each time I see a new advertiser in TheSpec, I think about the success of the sales rep who convinced them of the non-tangible benefits of Spec advertising in the age of Facebook and Google algorithms. Circulation is located on the first floor of TheSpec building and its fitting the second floor advertising, third floor newsroom and executive mahogany offices rest upon them. They make sure the paper is delivered, they respond to the angry phone calls of subscribers who are angered by content chosen by the newsroom, they sensitively assist families purchasing obituaries, and build the community partnerships at the foundation of the positive brand of the institution. Circulation staff promote TheSpec more than any other group I know in that building. Operations staff work the least glamorous jobs in the building. The printing press is an industrial factory, it’s loud, hot, smells (I happen to like the smell), and can be very messy. This says nothing of the hours, while we’re asleep, the printing press staff are working overnight. There are 26 people who lost their jobs at The Mercury today, eight were editorial (journalist) staff. 26 people, that’s all who remained after decades of cuts. I think about all those jobs whenever I think about layoff cycles. This is the part of a column where I should give some glimmering of hope, some call to action, or at the very least call on you to not allow what happened in Guelph to happen here. Here’s the brutal reality, the future of TheSpec is in the hands of Torstar and its shareholders. I don’t know if they care about our local papers like we locals do. 1986, 1986. The Spectator had the innovators it needed for the Internet Age, it was one of the first newspapers to go digital when it launched CompuSpec in 1986. 1986, that summarizes the frustration I feel watching the continuing decline of the newspaper that I grew up loving and the historic brand I still adore. A couple of corrections: Circulation numbers are still audited by CCAB. If you email me, I can send you the report — we don’t keep the numbers secret. Readership numbers are available on the website if you scroll to the bottom and select “Advertise with us”. Revenue numbers are private to the business, but I can tell you The Spec is holding its own. Thanks for thinking of other possible uses for our building. I like it as a local daily newspaper, and think we’ll be around for awhile. TheSpec does state the number of copies which are printed, which is the circulation numbers. The Guelph Mercury was reporting circulation of 11,343 for an average weekday. We know know the paid circulation was below 9,000. Circulation (and circulation demographics) were important figures on their own when advertising was the successful funding model for the daily newspaper. Paid subscriptions are of greater importance as advertising revenues decline. Subscriptions don’t replace the lost advertising revenue, but they do provide for future post-restructuring revenue. TheSpec is facing the same challenges as other daily newspapers. The challenge is nobody has figured out how to restructure the daily newspaper to both find new revenue and survive on smaller revenues. role it plays in our communities. Ditto for your CHCH piece. Great to have The Public Record back on the job!